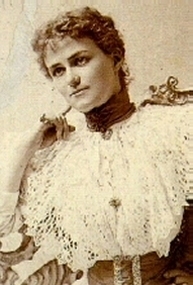 "Bessie Wallis Warfield", by Will Johnson, professional genealogist wjhonson@aol.com, at CountyHistorian.com, URL: http://www.countyhistorian.com/cecilweb/index.php/Bessie_Wallis_Warfield copyright 2007-8, all rights reserved. This page is locked, if you'd like to add or correct anything, please email me. I am available for hire to assist you to trace your family or create a biography of you or your relative. I charge $25 per hour. " Lookup your British family in the 1851 Census! Bessie Wallis Warfield was born on 19 June 1896 in Square Cottage, Monterey Inn, Blue Ridge Summit, Franklin County, Pennsylvania, as the daughter of Teackle Wallis Warfield and Alice M. Montague. They were at that resort due to a futile attempt to cure Teackle's tuberculosis. Teackle's health had been precarious for some time and he died that November, when Bessie was about five months old. Teackle was not a great commercial success in his career and left Alice and Bessie with little to support them. At first, Alice and Bessie moved in with Teackle's mother in Baltimore, Maryland but the two woman could not agree. Bessie in her autobiography says that it was either that Solomon Warfield, a bachelor uncle, also living there, fell in love with Alice in those close quarters, or that Alice's mother-in-law just didn't like Alice dating so soon after Teackle's death. The widowed Mrs Warfield still wore black more than a decade after her husband's death and evidently thought that was the proper course for Alice to follow. So Alice and Bessie moved again, to a hotel for some months, but then again into the house of her aunt. Alice however wanted a place of her own, and so they then took an apartment in a building with several other tenants. The biography at Answers.com states: "In the end the two women were supported by Teackle's wealthy brother Solomon Warfield." This however is not exactly true. Women of Alice's time and standing were very restricted in what sort of careers they could pursue. Alice did some small at-home sewing and took a hand at cooking for some of the other tenants in the apartment building where she lived, but the money deposited by Solomon, monthly into her bank account at his bank, is what kept most of the bills paid. Some biographers would have you believe that Alice "ran a boarding house". Alice however did not own the building. She merely found out that many tenants ate out, and offered to cook for them, in exchange for money. She was a great cook, but not great at minding the bills, and ended up spending more than she was taking in. So that ended her brief career as a cook. She never "ran a boarding house". As far as Wallis name, "she was christened Bessie but when she grew up, she dropped the Bessie and called herself Wallis" (The Amiable Baltimorians) In doing this, she was following a family tradition, as her father did not like his name Teackle, and always went by T. Wallis. Bessie Wallis was named Bessie for Alice's favorite older sister, and Wallis for her husband's middle name. She states that her name was all run together, her grandmother calling her "Bessiewallis" as if it were one name. Bessie married a U.S. Navy airman named Earl Winfield Spencer Jr. on 8 Nov 1916 at Christ Protestant Episcopal Church, Baltimore, Maryland. He however was "...a violent alcoholic", and she left him in 1921, but did not divorce until 10 Dec 1927. Moving to London, she married secondly to banker Ernest Aldrich Simpson on 21 Jul 1928 in Chelsea Registrar's Office, Chelsea, London, England. Wallis was divorced from her second husband on 27 Oct 1936 but not before she had begun a romantic relationship with Prince Edward who was at that time the heir to the English throne, being the eldest son of George V, King of England and his wife Mary von Teck. His father George having died on 20 Jan 1936, Edward became King but his desire to marry Wallis was firmly resisted by the government and public. His famous abdication speech on 11 Dec 1936 stated that, "The throne means nothing to me without Wallis beside me." (The Royals, page 15) They were married on 3 Jun 1937 in Chateau de Cande, Maine-et-Loire, France, and lived thereafter in semi-exile from Britain, mostly in France, although with occasional trips to Great Britain and the United States. The picture on the right shows Wallis and Edward VII when they married. After the abdication, Edward was made Duke of Windsor by his brother, the now-King, who took the name George VI. Wallis was styled Duchess of Windsor but by a new statute created just for her, she was not called "Her Royal Highness". This is much discussed in Kitty Kelly's book The Royals, where she states that George's wife, Elizabeth Bowes-Lyon better known as the Queen Mother, was jealous of Bessie because she had wanted to marry Edward herself. Edward and Wallis were thought, during WWII to be sympathetic to the Nazis. They adopted a jet-setting life-style of socialites until Edward died in 1972, after which Wallis was rarely seen in public. A picture of Edward and Wallis in their later years appears in the 1985 edition of the Encyclopaedia Brittanica. A book on Wallis' last days was writen in which her lawyer and caretaker Susan Blum was villified. Wallis died on 24 Apr 1986 in Bois de Boulogne, Paris, France. She was buried next to Edward, on 29 Apr 1986 at Frogmore House, Windsor, Berkshire, England. 1910 Census of Baltimore, Maryland showing : "J Freeman Rasin, 40, first marriage, 2 years ago, b MD/MD/MD, Insurance Broker; Alice M Rasin 40; Bessie W Warfield 13 stepdaughter b PA; Mary Louisa Shorter 27; Minnie Bacon 25; Willima E McDonnell 26; Henry Stitz"
The Frederick Post (Frederick, Maryland) 16 Nov 1928 "Would Set Aside Will", "Grandniece files Action Against S Davies Warfield Estate" in which : S Davies is named as the President of the Seaboard Air Line, his estate exceeds five million dollars, and "Wallis Warfield Simpson" a niece is mentioned as one of the legal heirs. Ironwood Daily Globe (Ironwood, Michigan), 15 Oct 1936 "Mrs Simpson Made Debut During Early Days of War" : "Most Talked of Woman in World Traces Lineage to Norman Knight" : transcribed here"Mrs Ernest Simpson ..... her friendship with King Edward VIII has made her "The Most Talked-of Woman in the World." So Laura Lou Brookman, novelist and staff correspondent of NEA Service, went to Baltimore to find out who Mrs Simpson is, what her girlhood and background were like. She tells the story of the debhood of "the Yankee at King Edward's Court" in this second of four articles." The Frederick Post (Frederick, Maryland), 15 Oct 1936 "American-Born Friend of King Seeks Divorce", "Mrs Simpson Takes Steps To Divorce Ernest Simpson; Hearing Oct 27"
The Amiable Baltimoreans, by Francis F Beirne. 1984. Page 118-121 citing "The Warfields of Maryland", by Prof Joshua Dorsey Warfield. Baltimore: The Daily Record Company, 1898. Teackle Wallis Warfield (AFN:9HQ8-XJ) was born in 31 Jul 1869 in Baltimore, Maryland, the son of Henry MacTier Warfield and his wife Anna Emory. He married Alice Montague in 1895 or 1896, and their only child Bessie Wallis Warfield was born a few months before his 15 Nov 1896 death due to tuberculosis, age 27. 1870 Census of Baltimore, Maryland showing : "Henry M Warfield, 44, Flour Merchant, $5000, b MD; Anna 38, Keeping House, b MD; Daniel 18 Clerk in Store b MD; Richard E 14, Attending School, b MD; Solomon D 10, Attending School, b MD; Henry 2, b MD; Wallis 1 b MD; Ann 58 At Home, b MD; Jane M 35 At Home, b MD; Maria 33 At Home, b MD; Annie Scott 50 Domestic Servant, b MD; Annie Gibson 20 Domestic Servant, b MD; Harriet Stepling, 22, Domestic Servant, b MD; Johanna Higgins, 39, Domestic Servant, b Ireland"
1880 Census of Baltimore, Maryland showing : "Henry M Warfield, 50, b MD/MD/MD, Flour Merchant; Anna 47 wife, b MD/MD/MD; Daniel 28 son b MD RR Inspector [something more illegible]; R Emory 24 son b MD Secty Firs [?] Ins Co; S Davis 20 son b MD Coffee Clerk; Henry M 12 son b MD At School; Teackle W 10 son b MD At School; Johanna Haggans 19 servent; Maria Thompson 29 black, servent"
Baltimore, Maryland Directories 1890 showing "Teackle W Warfield, 31 E Preston, Baltimore; Clerk"
Family Data Collection, "Teackle Wallis Warfield"
"The Smiths and the Chamberlains : also the Wilsons, Walters, Warfields, Van Sitterts", page 156. Citing "The Warfields of Maryland", by Prof. Joshua Dorsey Warfield. Pub Baltimore, 1898. Alice Montague was born 30 Nov 1869 in New Jersey, the daughter of William Latane Montague, a businessman and sometimes stockbroker, by his wife Sally Love. Alice Montague married Teackle Wallis Warfield in 1895 or 1896, their only child was Bessie Wallis Warfield. In 1908, Alice remarried to John Freeman Rasin, an insurance broker and "son of the Democratic boss of Baltimore", and the family lived in Baltimore, Maryland. More details on the Rasin family can be found here. Her last husband was Charles Gordon Allen. Alice died in 1929 and is buried at Rock Creek Cemetery in Washington, D.C.
1870 Census of Hackensack, Bergen County, New Jersey showing : "W L Montague, 45, Stockbroker, $1000, b VA; Sallie H 31, Keeping House, b MD; Frank H 10 b MD; Bessie 5 b MD; Willie L 3 b MD; Alice M 6/12 b NJ, born in January; Catherine White 33 Domestic Servant, b Ireland"
The Washington Post (Washington, D.C.), 19 Jun 1908. Page 7 "Social and Personal"
"It is reported that the marriage of Mrs Teackle Wallis Warfield to Mr John Freeman Rasin will take place shortly. Although the date for the wedding has not been definitely fixed, the Baltimore friends of Mrs Warfield and Mr Rasin expect the ceremony to be performed some time before July 1." "Mrs Warfield was formerly Miss Alice Montague. She comes of the well known Virginia family of that name and is a cousin of Mrs Alexander Brown formerly Miss Bessie Montague and of Mrs George Barnett who before her first marriage to the late Basil Gordon was Miss [illegible] Montague. Mrs Warfield is also a sister of Mrs D Buchanan Merryman of Washington. Her first husband was the late Teackle Wallis Warfield who has been dead about eleven years. He was a brother of Mr S Davies Warfield president of the Continental Trust Company of [illegible] .. Warfield adjutant general of Maryland and of Mr R Emory Warfield president of the Hanover Insurance Company of York." "Mr Rasin is a son of the late I Freeman Rasin and is widely known. His brother Mr Carroll Wilson Rasin takes an active part in the social and business life of the city. His youngest sister Miss Alice Rasin was recently married to Mr Barbour Dangerfield and lives in Washington. His other sisters are Mrs William Tyler Gatchell, Mrs William Pinckney Craig and Mrs Hugo Albert Pennert." "Mrs Warfield has just returned from Wakefield Manor where she was the guest of Mrs Barnett. Mrs Merryman went from Washington yesterday to be a guest of Mrs Warfield at her home at East Bidell street Baltimore." 1910 Census of Baltimore, Maryland showing : "J Freeman Rasin, 40, first marriage, 2 years ago, b MD/MD/MD, Insurance Broker; Alice M Rasin 40 b NJ/VA/MD; Bessie W Warfield 13 stepdaughter b PA; Mary Louisa Shorter 27; Minnie Bacon 25; Willima E McDonnell 26; Henry Stitz"
Baltimore City Directory, 1912 showing : "John F Rasin, ins, h 212 E Biddle"
"Alice Montague Allen" at FindAGrave stating "birth 1869, death 1929, Mother of the Duchess of Windsor" The Inscription is then stated there to actually read only : "Alice Montague Allen, wife of Charles Gordon Allen, daughter of William Latane Montague and Sally Love Montague 1869-1929" burial at Rock Creek Cemetery, Washington, D.C.
"Alice M Montague" on the Family Data Collection stating her birthdate as "30 Nov 1869"
1900 Census of Baltimore, Maryland showing "John F Raisin, age 30, single" in the household of his father. "Alice M Montague" on ThePeerage, the picture there is labeled "Alice Montague Simpson"
More details on the Rasin family can be found in the book Baltimore : It's History and It's People which states that Alice Montague, who married John Freeman Rasin, was the widow of Teackle Warfield, and the daughter of William L Montague. Henry Mactier Warfield (AFN: VGR7-PS) was the son of Daniel Warfield by his wife Nancy Mactier. He was born 1820 or 1825 in Maryland. He married Anna Emory between 1847 and 1850 probably in Baltimore. He and Anna lived all, or the majority of their lives in Baltimore, Maryland. He died in 1885. 1850 Census of Baltimore, Maryland showing : "Henry M Warfield, 25, Merchant, b MD; Ann 20 b MD; Mary Jannison ?, 19, b Ireland"
Biography and Genealogy Master Index showing : "Warfield, Henry Mactier (1825-1885)" and citing "Appleton's Cyclopaedia of American Biography. A supplement. Six volumes. Edited by L.E. Dearborn. New York: Press Association Compilers, 1918-1931. Originally published as The Cyclopaedia of American Biography, Supplementary Edition. (ApCAB X)"
"The Warfields of Maryland", by Prof Joshua Dorsey Warfield. Baltimore: The Daily Record Company, 1898. Page 21 : "Henry Mactier Warfield, the prominent merchant, legislator and candidate for Mayor of Baltimore City, married Anna, daughter of Richard and Ann (Gittings) Emory, of "Manor Glen," of "My Lady's Manor." She was a descendent of the Emorys of 1666, of Queen Anne Co."
Anna Emory was born abt 1832/3 in Maryland, the daughter of Richard Emory and his wife Ann Gittings. She married Henry M Warfield between 1847 and 1850, and they had several children. Henry and Anna lived all or the majority of their lives in Baltimore, Maryland. 1850 Census of Baltimore, Maryland showing : "Richard Emory, 52, Farmer, $10,000 [or $60,000], b MD; Ann 51 b MD; Thomas 21 b MD; Nicholas 14 b MD; Richard 11 b MD; Henry Gittings 26 b MD; Elizabeth Gittings 25 b MD; Ann Gittings 5 b MD"
William Latane Montague was born about 20 Aug 1824 in Buckingham County, Virginia, the son of Henry Brown Montague and his wife Mary Anne Moody. He married, on 25 Feb 1858, Sally Howard Love. They lived first in Maryland but later moved to Hackensack, Bergen County, New Jersey where their daughter Alice was born Nov 1869. William Latane Montague married secondly 22 June 1888, Miss Mary E Hazlett of Talbot County, Maryland. He died in 1909. "Alice Montague Allen", Photograph of her tombstone at FindAGrave stating "birth 1869, death 1929, Mother of the Duchess of Windsor" The Inscription is then stated there to actually read only : "Alice Montague Allen, wife of Charles Gordon Allen, daughter of William Latane Montague and Sally Love Montague 1869-1929" burial at Rock Creek Cemetery, Washington, D.C.
More details on the Rasin family can be found in the book Baltimore : It's History and It's People, stating that Alice Montague, who married first to Teackle Warfield and second to John Rasin, was the daughter of William L Montague. "William Latane Montague" on Family Data Collection stating that he was born 20 Aug 1824 in Buckingham County, Virginia to Henry Brown Montague and his wife Mary Anne Moody. History and Genealogy of Peter Montague of Nansemond and Lancaster counties, Virginia and his descendents, 1621-1894, page 136, line 509 : "William Latane b Aug 20, 1824". His birthplace is not stated, but his next-elder brother was born in Cumberland County, Virginia, while his next-younger brother was born in Richmond County, Virginia. So it is likely he was born in one or the other of those counties. History and Genealogy of Peter Montague of Nansemond and Lancaster counties, Virginia and his descendents, 1621-1894, page 227, line 509 : "William Latane Montague, son of Henry B , b Aug 20, 1824 in Buckingham Co., Va. In 1848, at the age of 24, he came to Baltimore, Md., took a clerkship with Harrison & Co., a package dry goods house, thence in 1852 he embarked in the insurance business, which he abandoned in 1865 for the sugar and coffee trade in Baltimore. In 1867 he left that business and went to New York and became a stock broker until 1876 when he returned to Baltimore and engaged in the same business. In April, 1891, he returned to Richmond, Va., to engage in mercantile pursuits, after an absence of 43 years. He m (1), Feb 25, 1858, Miss Sallie Howard Love, dau. of Capt. Thomas Love of Baltimore. She d in New York, April 22, 1876 and was interred in Greenmount Cemetery in Baltimore. He m (2), June 22, 1888, Miss Mary E Hazlett of Talbot Co, Md. Sally Howard Love was born about 1839 in Maryland, the daughter of Capt. Thomas Love of Baltimore. She married William Latane Montague and they lived first in Maryland but by 1870 had moved to Hackensack, Bergen County, New Jersey where their daughter Alice was born Nov 1869. Sally died in New York 22 Apr 1876, and was buried at Greenmount Cemetery in Baltimore, Maryland. 1850 Census of Baltimore, Maryland showing : "Thomas Love, 46, Farmer, $40,000, b MD; Fannie 33 b MD; Sally H 12 b MD; John T 9 b MD; Fanny 4 b MD; Albert 2 b MD and nine more people perhaps Lodgers ?" "The Warfields of Maryland", by Prof Joshua Dorsey Warfield. Baltimore: The Daily Record Company, 1898. Page 20 : "Benj, second son of Seth and Mary (Gaither) Warfield, located at the junction of the old Frederick and Woodbine Road. He married Ariana Dorsey, daughter of Henry and left Charles Dorsey, Alfred, Daniel, Nicholas Dorsey, Elizabeth, Sarah, Margaret and Maria." Ibid, Page 21 : "Daniel lived at 'White Cottage,' married first, Sarah Meriweather, and second Nancy Mactier, daughter of Alexander and Frances (Crain) Mactier of Scotland...."
Richard Emory was born about 1798 in Maryland. Richard Emory married Ann Gittings on 31 Mar 1824 and they had several children, among whom was Anna Emory, who was born about 1832/3 in Maryland. In 1850 the family is living in Baltimore, Maryland. "Maryland Marriages, 1655-1850" at Ancestry stating : "Richard Emory to Ann Gittings; Baltimore, Maryland; 31 Mar 1824"
Ann Gittins was born about 1799 in Maryland. Ann Gittings married Richard Emory on 31 Mar 1824 and they had at least one child Anna Emory. By 1850 they are living in Baltimore. Ann Gittings died in 1882. Henry Brown Montague was born in 1795 in Virginia, the son of John Montague and his wife Rebecca Brown. He was living in Buckingham County, Virginia and married to Mary Anne Moody by 1824 when his son William Latane Montague was born there on Aug 20. "William Latane Montague" on Family Data Collection stating that William was born 20 Aug 1824 in Buckingham County, Virginia to Henry Brown Montague and his wife Mary Anne Moody. History and Genealogy of Peter Montague of Nansemond and Lancaster counties, Virginia and his descendents, 1621-1894, page 227, line 509 : "William Latane Montague, son of Henry B , b 20 Aug 1824 in Buckingham Co., Va.
History and Genealogy of Peter Montague of Nansemond and Lancaster counties, Virginia and his descendents, 1621-1894, page 135 : "Henry Brown Montague, son of John , b 13 Aug 1795, m 8 Dec 1816 in Richmond, Va, Mary Anne Moody, only child of Capt. John Moody* of the Revolutionary army. She d 24 June 1882, in Richmond. He removed to Baltimore, Md. about 1849, where he d 4 April 1855"
Mary Anne Moody died in 1882. "William Latane Montague" on Family Data Collection stating that he was born Aug 20, 1824 in Buckingham County, Virginia to Henry Brown Montague and his wife Mary Anne Moody. Thomas Love was born about 1804 in Maryland. He married Frances "Fannie" probably in Maryland and they had several children including Sally Howard Love b 1838. Thomas Love died in 1886. In 1848, at the age of 24, he came to Baltimore, Md., took a clerkship with Harrison & Co., a package dry goods house, thence in 1852 he embarked in the insurance business, which he abandoned in 1865 for the sugar and coffee trade.... He m (1), Feb 25, 1858, Miss Sallie Howard Love, dau. of Capt. Thomas Love of Baltimore. Frances Priscilla Presbury was born 1817. She died 1877. Benjamin Warfied, married in 1774 to Ariana Dorsey. Benjamin Warfield died in 1827. Alexander MacTier was born in 1757/8. In 1787 he married Frances Crane. Alexander MacTier died in 1831. "The Warfields of Maryland", by Prof Joshua Dorsey Warfield. Baltimore: The Daily Record Company, 1898. Page 21 : "Daniel lived at 'White Cottage,' married first, Sarah Meriweather, and second Nancy Mactier, daughter of Alexander and Frances (Crain) Mactier of Scotland...."
Frances Crane or Crain was born 1761. Thomas Lane Emory was born in 1757, and died in 1828. Archibald Gittings married in 1799 to Margaret Bosley. Archibald Gittings died in 1832. "History", Time After Time : History of Harford and Baltimore Counties, Vol 1, No 4, Aug 1991 : "Elijah [Bosley]... died in Sep 1841 at the age of 107. He had two children, Nathaniel M and Margaret (wife of Archibald Gittings)....the bulk of his estate went to his grand-daughter Ann (Gittings) Emory, wife of Richard Emory." John Montague was born in 1755 in Orange County, Virginia. He married Rebecca Brown in 1774 in Spottslyvania County, Virginia. He was a soldier in the Revolutionary War from Virginia. At some point the family moved on to South Carolina where he died in 1831 in Abbeville District. History and Genealogy of Peter Montague of Nansemond and Lancaster counties, Virginia and his descendents, 1621-1894, page 89 : "John Montague, son of Thomas , b about 1755, in Orange or Spotts. Co, VA. Removed to Cumberland Co. with his parents where he grew to manhood....He m. Jan 7, 1774 Miss Rebecca Brown, a sister of [Sarah Brown] the wife of his brother Thomas. He moved from Cumberland Co., Va to Abbeville Co., SC about 1808. All of his children accompanied him except his sons William L and Henry B"
John Moody was a soldier in the Revolutionary War. John Moody died in 1828. Thomas Love was born in 1753. In 1802 he married Martha Worthington. Thomas Love died in 1821. George Gouldsmith Presbury was born in 1784. In 1809 he married Sarah Cassaway Howard. George Presbury died in 1863. Site reader, Christopher Smithson, Professional Genealogist states that Sarah was the daughter of Thomas Gassaway Howard. Seth Warfield was born in 1723/4. He married Mary Gaither. Seth Warfield died in 1805. Henry Dorsey was born in 1712. In 1735 he married Elizabeth Worthington. Henry Dorsey died in 1770. Part of these ascents obviously comes from the detailed research above, part of them however comes from the dubious source OneWorldTree. Do not cite this page as fact for that part, only cite this page as speculation for that part. This page was last modified on 25 January 2010, at 00:32. This page has been accessed 785,347 times.